A character in Virginia Woolf’s Night and Day remarks on the music hall as a place where ‘polar bears follow directly upon ladies in full evening dress, and the stage is alternately a garden of mystery, a milliner’s band-box, and a fried-fish shop in in the Mile End Road.’ We can add a boxing ring to this mix and wonder at the female boxers who took part. Step forward French fighter Marthe Carpentier, billed as the Champion of the World. 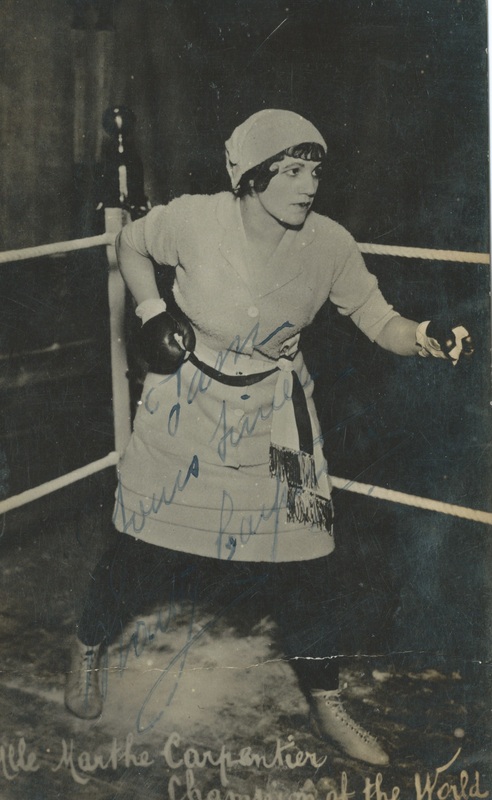 In March 1914 Marthe knocked out an English opponent, Lucie Warner, during a bout in France and threw out a challenge to any woman of her weight to fight her for the Championship of France. The snag was that she wouldn’t disclose her weight and claimed the right to weigh what she liked when she entered the ring. She said that would-be opponents were welcome to look her over to decide if they were in the running. I can’t find evidence of anyone looking her up and down or taking up the challenge. Gymnastic and balancing acts received a mixed reception but were advertised with a use of superlatives to create wonder and awe in anticipation of the performance. The audience were treated to daring, extraordinary, sensational and Herculean feats although the stage paper, The Era, suggested that there was a danger of this kind of performance being overdone. Performers who enthralled their audiences with balancing acts were known as equilibrists which conjures up someone a little out of this world. 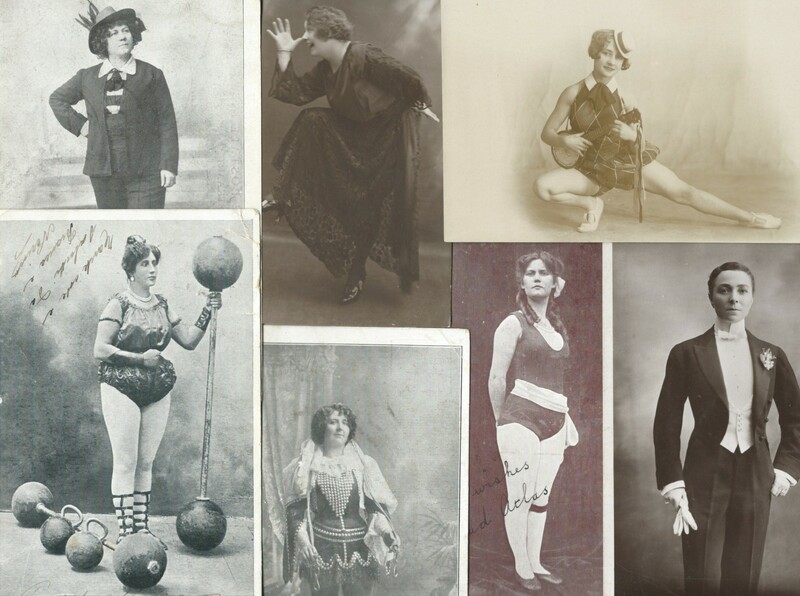 I’ve found references to grotesque gymnasts, along with comic and aerial but the most intriguing of all is the phantom gymnast, La Belle Gertella. Any information on her or her act would be gratefully received. 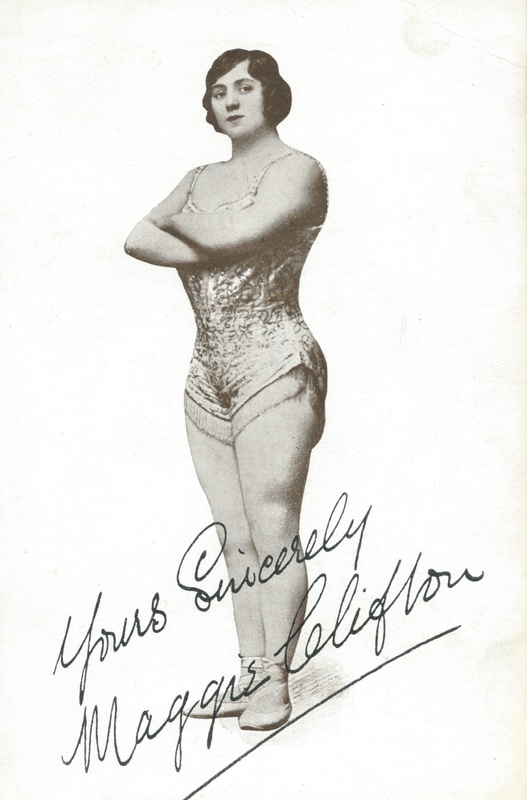 The 5 Original Cliftons advertised as ‘Belgium’s greatest gymnastic, equilibrist wonders,’ featured Maggie Clifton who performed head and hand balancing feats. She is described as the ‘wonder of wonders‘ and is the only individual in the group to get a mention. An acerbic comment in the Leeds Times remarks that some of their acrobatic endeavours have the ‘recommendation of being novel, which cannot generally be said of gymnastic feats.’ This might explain the move towards the comic and the grotesque with which some artistes tried to make their mark. Maggie seems to have worked with the troupe for a few years and is then billed around 1915 as appearing with a male partner. A review describes her as ‘incomparable‘ and giving a performance of more than average excellence. We do not find out the name of her partner. In the late nineteenth century a Harvard Professor warned that those who had been most successful in heavy gymnastics were also subject to nervous complaints. Falling and being dropped by fellow gymnasts might have had something to with that. This entry was posted in gymnasts, Women boxing and tagged Maggie Clifton, Marthe Carpentier on May 13, 2015 by Monomania.